Also, I am very struck by the vantage point of looking eastward to your home, having always thought of myself as part of the West, looking in an even more westerly direction to find the missing pieces of a pan-Pacific civilization. LOL – love it. I think we’d have to call it “Where’s Ka Moa?”, though, to stick with the linguistic theme. 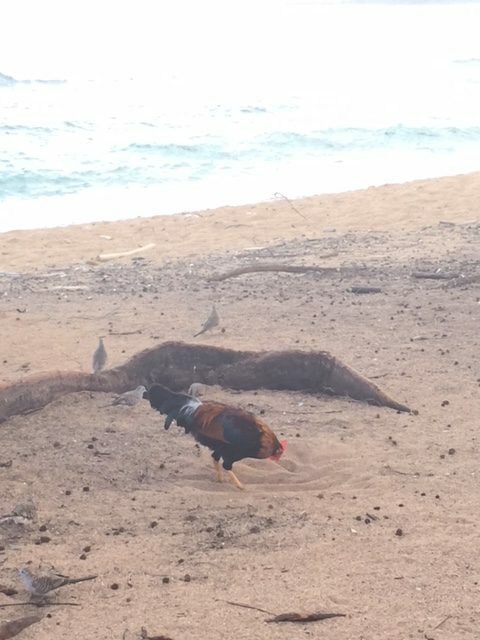 And never fear, the Chickens of Kaua’i will be highlighted fer-reals in a post-to-come. As for gazing eastward to the Americas, it was weird and wonderful. “Camped” on the eastern side of the island, every dawn and dusk reversed my California conditioning as well; the morning sun rose over the water and set behind the mountains. Caveat: this Garden Island Vacay blog-series will not be studded with drop-dead stunning pics of the Garden Island. I doubt I’d have managed many great snaps if I’d tried. Only a truly skilled photographer with all the right equipment could hope to capture Kaua’i’s breathtaking natural beauty in stills – and even then, sorry, they’re going to be a distant second best. Images freeze time. Nature is ephemeral. Images tap only one of our senses. Nature fills them all. I’m a crap photographer. My “camera” is an iPhone 6. And, bottom line, I didn’t try. I had one sweet week to spend on the Garden Island, and damned if I was going to filter the experience through the tiny lens of a carcinogenic communications device. Sure, I took a few pictures. 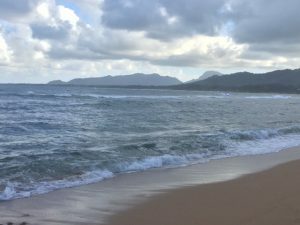 Not because I thought I could digitally do Kaua’i justice, but because (as Liane sagely advised), even pics that woefully belie the island’s magic trigger visceral memories of what it was like to be there. No worries. Two Tickets may fail as a pictorial travelogue, but I did luck out with a few great shots, and I’ll be augmenting my meager visuals with appropriate additions from the inter-tubes. So. 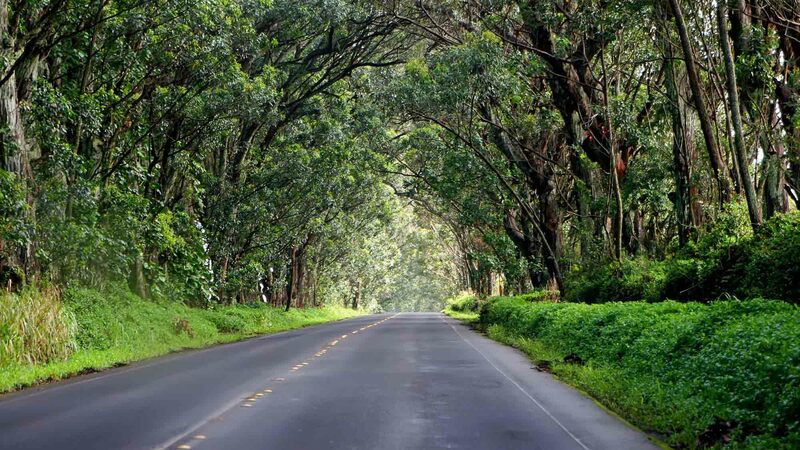 Caveat covered, let’s rejoin the sisters where we left them – merging onto the Kuhio Highway just outside of Lihu’e. Kaua’i’s most heavily-traveled thoroughfare is a two-lane road that expands to three lanes for a brief jog between Lihu’e and Wailua, presumably to facilitate traffic into the island’s largest urban center on weekday mornings and out of it on weekday evenings. I couldn’t exactly snap pics while behind the wheel, but I did find this free-use shot of a major highway junction in the Lihu’e area. Kinda makes you re-think your definition of “highway”, yeah? It didn’t take me long to realize the foliage I’d seen outside baggage claim was a paltry representation of the verdant wonders awaiting us. All the Hawai’ian islands are lush, but as it’s the wettest, Kaua’i is the lushest. 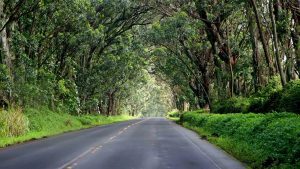 Touring the island by car, you pass between giant walls of green – tall grasses and monstrous high bushes – through graceful groves of coconut palms, under arching, liana-entwined trees, and by sweeps of sand and expanses of sea so gorgeous, they make you gasp. Every island has its mountains as well – or its active/extinct volcano(es), to be precise. A single magma “hotspot” has been sequentially adding new land-masses to the Hawai’ian Chain for millions of years. Recently, it’s been bulking up the already-gigantic Big Island through eruptions at Kīlauea, while simultaneously creating Lōihi Seamount, an active volcano/soon-to-be island about 975m/0.6mi below sea level and 35km/21.75mi off Hawai’i’s southeast shore. are more typical of the newer islands. The Garden Island’s impressive age (about 5.1 million years) and age-whittled size means a typical vista is more like . . .
And I mean typical. 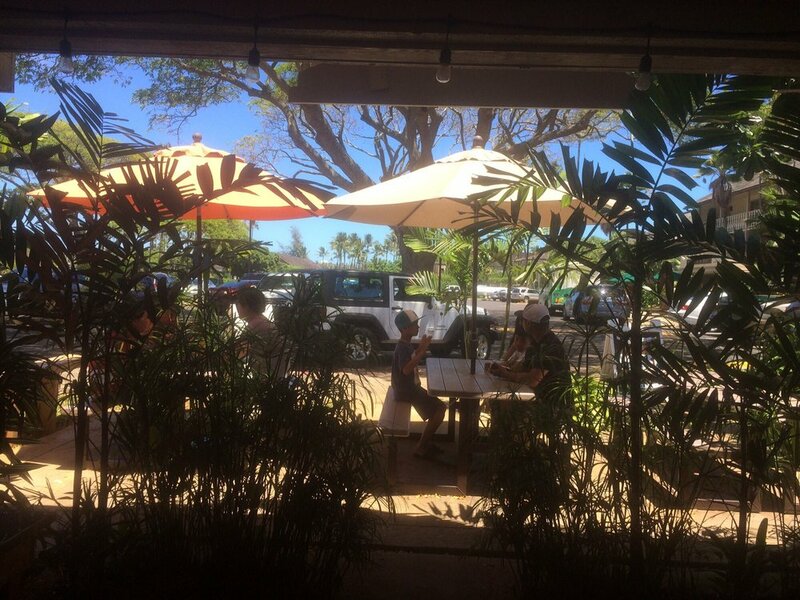 This was our view from the Kalalea Juice Hale in Anahola (a census-designated place (CDP) at the northeast end of Highway 56), where we stopped next day for a couple of omg-delicious smoothies. 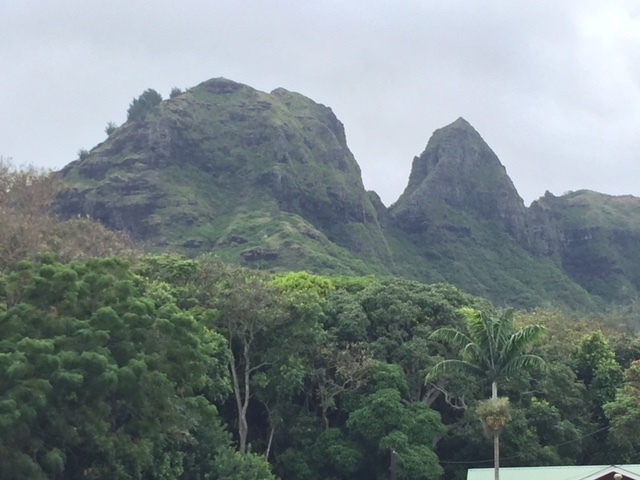 The peak is Kalalea Mountain, the highest point of the Moloa’a Forest Preserve. Look familiar? Kalalea stood in for Peru in the opening shot of the 1981 film Raiders of the Lost Ark. I’ve got two more road-related observations for you before we reach the hotel. First – speed limits. The Garden Island offers a wide assortment. The signage tells you to slow down a little for sparsely-populated sections and a lot for a town, to open ‘er up in the countryside, to back off on curves, and more. 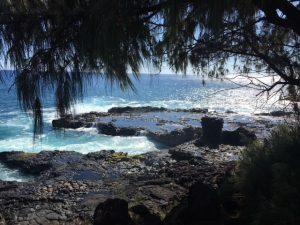 When we day-tripped to Kīlauea Lighthouse (about 31km/19mi – a 35-minute drive), we bounced between 25mph and 55mph hitting every possible 5-mile increment multiple times before finally cruising into the parking lot at a mandated 5 (or was it 2?) mph. 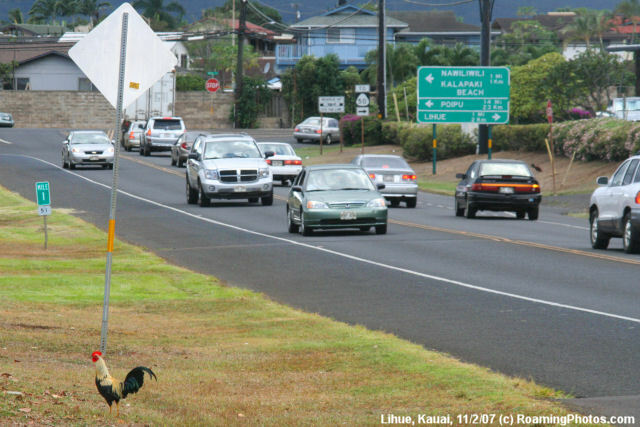 Very occasionally someone (another tourist, I expect) would tailgate me for a bit to let me know they wanted to exceed the posted max, but most of the time, Kaua’i’s laid-back, hang-loose ambiance was as palpable on her roads as on her beaches. Just about everyone drove the speed limit or thereabouts, when traffic allowed. Just about everyone – and this was novel for me – happily maintained a safe driving distance, even when they were stuck behind a car going way slow. 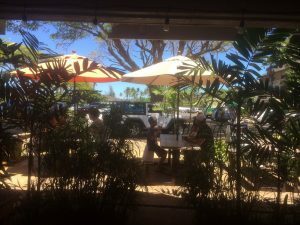 It is incredibly uncool (and un-Hawai’ian) to stress about stuff, which made driving in Kaua’i darn near stress-free. Lastly – decals. On the mainland, a certain percentage of tourists arrive at their vacation destination in their own vehicles, making them easy to spot. An Arkansas license on a Sonoma road – bingo! The occupants of that car are not locals. Nobody drives to Hawai’i. All the cars on all the islands carry Hawai’ian license plates, making it impossible to know if it’s a native or haole behind the wheel. 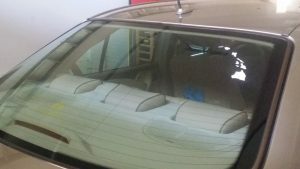 While all cars have HI license plates, some chassis and windshields are pristine, while others sport stickers and decals – often in great numbers. Took a while, but it finally dawned on me that the decals were more than an aesthetic choice. They were a statement of residency. No need for a sticker that specifically says, “Hawai’ian Native.” If you can decorate your car, then you’re not a visitor to the island. You live here. Liane navigated us from the airport to the hotel with no trouble at all. Duh! I know you’re rolling your eyes at me. Of course she did. She’s been there how many times? Trust me, this is worth noting. My sister and I are opposites in many ways. Looks (“Which one’s yours?” people would ask my mother back in the day), personality (Liane – amiable extrovert, Risa – combative introvert), taste in movies (happy-ending romances v gritty action-adventure) . . . the list goes on. And one of the items near the top of that list is sense of direction. I have a good one. Liane has a bad one – or rather, she has an anti-sense of direction. Legacy from my mom. We’re not just talking about pervasive confusion about north/south or how to translate a road map to the road. We’re talking about instincts that infallibly lead my sister to turn left when she should be turning right. 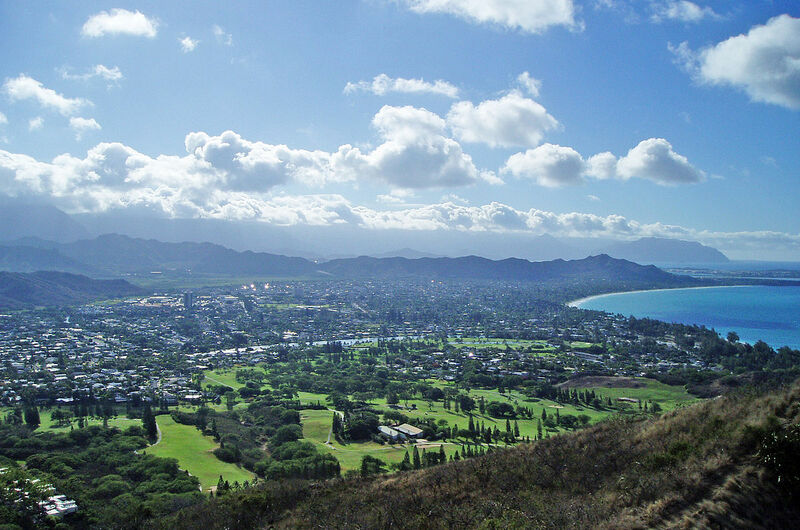 Familiarity with an area makes a big difference, and Li is pretty darn familiar with Kaua’i. She did a bang-up job of getting us around the island. And while I’m sure a lifetime of heading off in the exact wrong direction from where the car is parked must be aggravating as hell for her, I can’t help it – I find it adorable. The lobby of the Aston Islander on the Beach has half the usual complement of walls. It’s a breezeway, really, except that most breezeways join two structures – a house and a garage, for example – and this breezeway is a spacious, furnished room. Not much breeze that day, unfortunately, as the receptionist regretfully remarked. I may have mentioned . . . it was hot. We sort-of checked in, but were too early to get a room key. Not a problem. We hadn’t eaten since that breakfast udon, so we left our bags in a corner of the lobby and wandered off to score our first island meal. We considered the tiny vegan shop in the adjacent Coconut Marketplace, did not consider the pizza place in the same location, and ended up at the Sleeping Giant Grill, one of a handful of commercial businesses at the edge of the Aston Islander parking lot. but the shellfish, chicken, pork, and beef also looked amazing. They will sell their fish and meats to you in large steak-portions, if you wish, so you can take them to one of the poolside bbqs and grill them yourself. They have vegetarian and vegan options. 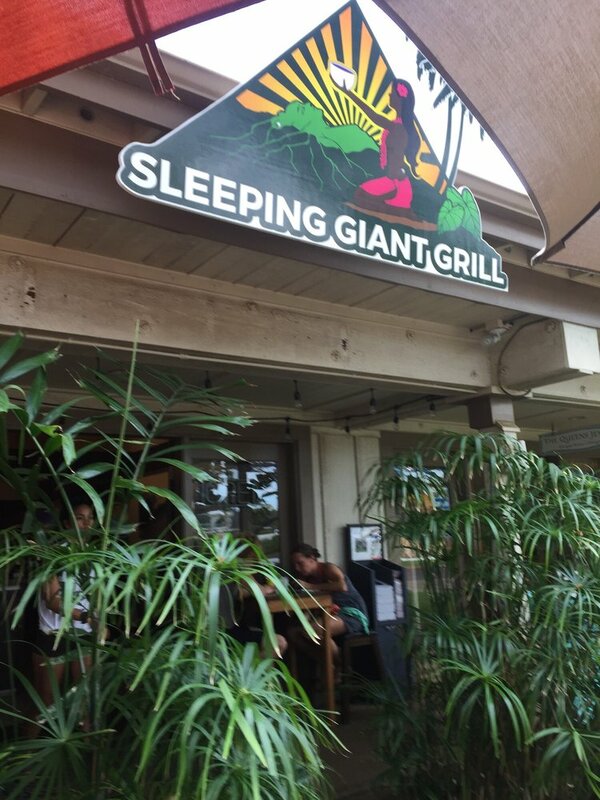 And their mochi-style dishes (marinated in home-made teriyaki sauce, battered in rice flour and panko crumbs, then fried) get such rave reviews, they elevated the Sleeping Giant to #15 on TripAdvisors’ “Best Tacos in America” list. Liane ordered the shrimp special, if I remember rightly. I got the wrap (large flour tortilla, cabbage, carrots, cucumbers, mung bean sprouts, brown rice, sesame island dressing – red onions, if you want them) with ono. 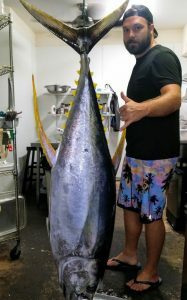 Ono is closely related to king mackerel. Unlike the mackerel you are now imagining, ono’s texture is delicate and flaky, its flavor is mild, and it’s not oily at all. Ono is ‘ono – sweet and delicious. Nothing compares. It was love at first bite. When we’d killed enough time, we got our key, found our room and, at long last, settled in. It was a good news/not-so good news sort of thing. 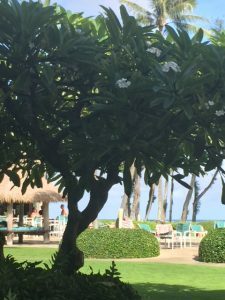 The Aston Islander on the Beach is an old-style Hawai’ian ocean-side hotel; a cozy clutch of not-too-tall buildings (3 stories) artfully arranged around a pool and a pool-side bar. 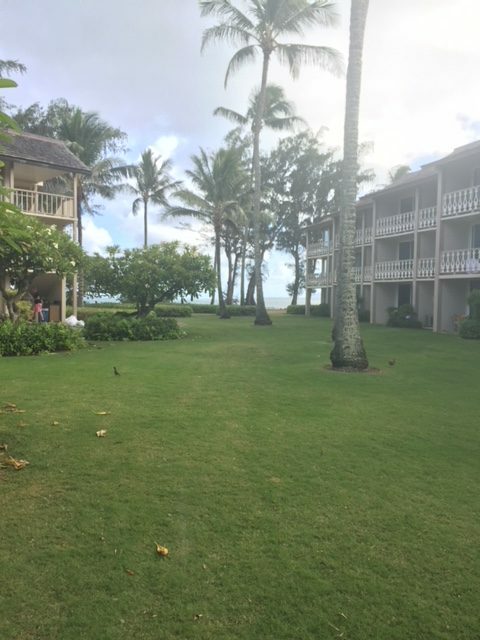 All the hotels on Aleka Place have their water-front, perfect-view, breezy-lānai (roofed, open-sided veranda) rooms and their cheaper set-back, decent-view, less-breezy-lānai rooms. Naturally, we’d opted for the latter. Here’s the view out our front door. Here’s the view out the back. Liane has a bad hip, my knees have seen better days; we were pleased not to have to climb stairs. The air-conditioning, though . . . have I mentioned that it was hot? We tried opening the screen door onto the lānai, but there was no breeze at all. We closed the door, set the fan on high, the thermostat on low, and went for a walk along the shore, where there is always, always a breeze. 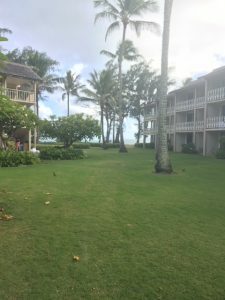 We walked quite a ways, past the neighboring hotels, through the narrow woods at the edge of a chirping field, basically from the Kekui Heiau (a heiau is a sacred site) to the sacred stones outside the Marriott Kaua’i at Coconut Beach. It was an ebb tide. 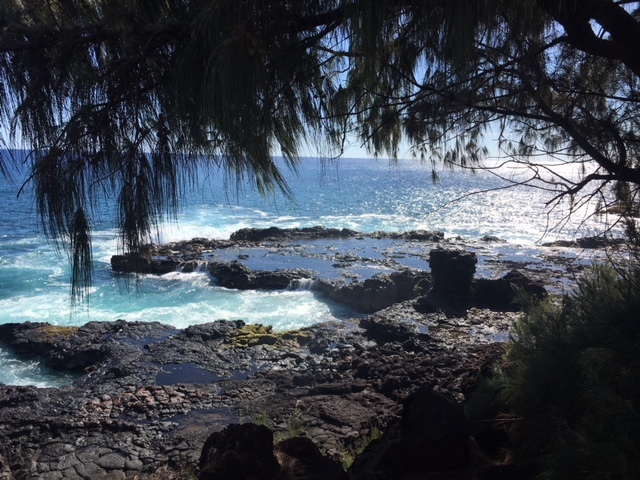 The waters were low enough to lay bare the volcanic bones of Kaua’i where she meets the sea. For Liane . . . is home where the heart lies? Then this was her homecoming. Wherever she is, this beach on Kaua’i is where she longs to be. 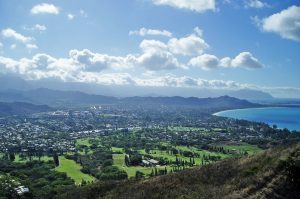 As for me, I’d seen plenty of Hawai’i vacation pics, pics much like the ones I’ve posted here. Looking eastward over the Pacific for the very first time, I saw that a picture is to paradise what a single note is to a song.